The new TV spot for Avengers: Endgame wants to take you on a little trip down memory lane. The clip opens with the words of Nick Fury (Samuel L. Jackson), with dialogue from 2012's The Avengers heard in voiceover: "Heroes. It's an old-fashioned notion." The sentiment rings over footage of an eerily empty Avengers headquarters, before segueing to a snippet of the iconic sequence in which Tony Stark first suits up in his Mark II armor. The narration (courtesy of the Stark Expo announcer from the opening moments of Iron Man) chimes in: "A visionary, a genius… ensuring freedom around the globe." We then get a few brief clips from Captain America: The First Avenger and Captain America: The Winter Soldier as the star-spangled Avenger gets his due in voiceover: "A symbol to the nation… a hero to the world." Next up is Thor, "a beacon of hope shining out across the stars," spotlighted in footage from all three Thor flicks, followed by the Guardians of the Galaxy, described with a clever bit of editing. "I look around at us," begins Peter Quill's narration, "you know what I see?" Smash cut to Peter Serafinowicz as Denarian Saal in the first Guardians film, offering up his famous description of the team: "A bunch of a-holes." The spot then sidles through choice scenes from Doctor Strange, Ant-Man, Avengers: Infinity War (showcasing Tom Holland's Peter Parker), and Black Panther, as the narration intones, "The world is changing… we need heroes." Cue up a carefully selected clip from Iron Man 2, in which Tony Stark comes to the rescue of a masked youngster who we now know to be a very young Parker, followed by a couple of the more iconic MCU scenes in recent memory: Captain Marvel singlehandedly laying waste to a monolithic starship, and Black Panther's impassioned cry of "Wakanda Forever!" as Infinity War's Battle of Wakanda begins. The clip then proceeds, in order (well, almost — Infinity War is presented last), through a rush of brief scenes from every single MCU film to date. In case one or two slipped your memory, we revisit: Iron Man (2008), The Incredible Hulk (2008), Iron Man 2 (2010), Thor (2011), Captain America: The First Avenger (2011), The Avengers (2012), Iron Man 3 (2013), Thor: The Dark World (2013), Captain America: The Winter Soldier (2014), Guardians of the Galaxy (2014), Avengers: Age of Ultron (2015), Ant-Man (2015), Captain America: Civil War (2016), Doctor Strange (2016), Guardians of the Galaxy Vol. 2 (2017), Spider-Man: Homecoming (2017), Thor: Ragnarok (2017), Black Panther (2018), Avengers: Infinity War (2018), Ant-Man and the Wasp (2018), and Captain Marvel (2019). Throughout, the Vision's monologue from Age of Ultron teases the coming conflict promised by Avengers: Endgame. "Our very strength invites challenge. Challenge incites conflict. Conflict… brings catastrophe." More words of wisdom from the synthetic Avenger wrap up the montage: "A thing isn't beautiful because it lasts." What? No, we're not crying. It's allergy season. Moving on. Finally, we hear the ominous declaration of Doctor Strange from Infinity War, "We're in the endgame now," over a shot of Thanos preparing to meet the Avengers from the new film. "Before we're done," we hear Tony Stark asserting over shots of the team preparing for battle, "we still have one promise to keep." That promise? Stark stated it all the way back in the first Avengers flick, but it bears repeating in light of Infinity War's shocking, heartbreaking ending: "If we can't protect the Earth, we damn sure will avenge it." The spot concludes with a shot of our heroes on the surface of a barren, wasted planet (almost certainly Titan) as a tinkling, melancholy piano version of the Avengers theme is heard. Look, it's not as if Endgame really needs any more promotional spots at this point, but this trailer is a thing of beauty. It serves to remind us just how far the MCU as a whole has come since its early years, not to mention how far our favorite heroes have come on their emotional journeys over the course of eleven years and all… those… movies. 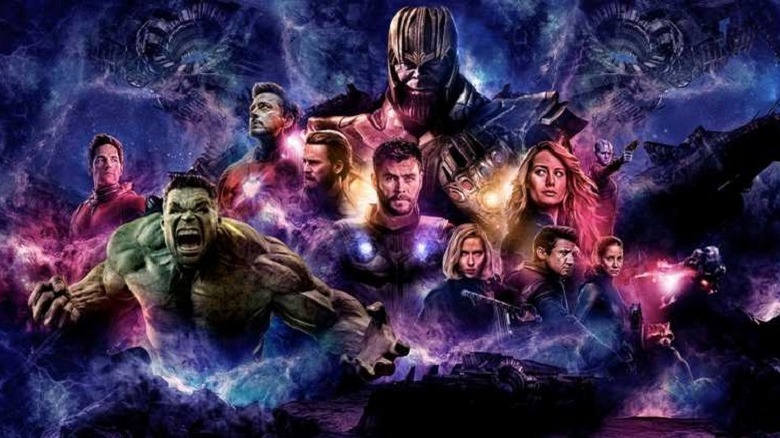 Endgame is more than just a huge summer blockbuster-in-waiting, more than a mere sequel. Like the Avengers themselves, it's a film that promises to be greater than the sum of its parts — all 21 of them, a series that has ignited imaginations, made superstars out of virtual unknowns, and brought to life the childhood heroes of millions. It represents a Herculean, unprecedented feat of cinematic storytelling — and as cool as all the trailers have been so far, this one treats the flick with the gravity it deserves. In case you weren't aware, Avengers: Endgame will draw to a close the first three phases of the Marvel Cinematic Universe, collectively known as the "Infinity Saga," and will see our heroes attempting to reverse the Decimation, in which an Infinity Gauntlet-wielding Thanos snapped his big purple fingers and wiped out half of all life in the universe, including such favorites as Spider-Man, Black Panther, and Doctor Strange. The flick has already shattered records for ticket presales, has invited speculation that it could be the first ever to breach the $300 million dollar mark domestically on its opening weekend, and is probably the first-ever viable challenger to James Cameron's Avatar to become the highest-grossing film of all time; in other words, it's kind of a big deal. It lands in theaters in ten short days, on April 26.